ST. PETERSBURG, Fla.—Neither wind nor rain nor threat of tornado could stop qualifying for the IndyCar Firestone Grand Prix of St. Petersburg, but it was a near thing. In the end, qualifying took place and after four rounds, Takuma Sato in the #14 ABC Supply/AJ Foyt Racing Dallara-Honda won the pole position for the IndyCar season opener. Sato had been fast all weekend, but so had a lot of his rivals, and when the final six came together for the final qualifying session, Sato faced a field of IndyCar’s top guns. In the final session were Will Power of Verizon Team Penske, who has won the pole in St. Pete three times, Scott Dixon, who has won the championship three times, and his Target Ganassi Racing teammate Tony Kanaan, also a champion and winner of the 2013 Indy 500. Also there were two Andretti Autosports drivers, 2012 champion Ryan Hunter-Reay, and Marco Andretti, who hasn’t won in a few years but had his career-best season in 2013 and is very hungry for results. These five drivers race for the Big Three, the teams which have dominated IndyCar in the 21st century. These are teams with multiple championships, and teams which often field three or four cars. Yet Sato, driving for a one-car team funded by a building supply company, showed that fast doesn’t respect reputation. Qualifying for the first race of IndyCar’s 2014 season almost didn’t happen; St. Pete was slammed with thunderstorms which brought the threat of lightning and tornadoes. Race organizers had to evacuate the stands and shepherd everyone into parking garages and the lobbies of buildings around the track to keep everyone safe. The day’s schedule had to be truncated and rearranged, with IndyCar qualifying pushed back more than three hours, until 5:30 p.m. Some fans, seeing the dark skies and the ugly radar pictures, decided to head for home early, but most stayed and were treated to four rounds of knock-out qualifying which tested the drivers and teams much more than usual. In knockout qualifying, the field is split into two groups, each of which turns laps for ten of fifteen minutes. The top six of each group advance to round two, repeat the process, and the top six of that group—the Fast Six—go out for a final ten-minute shootout for the pole. After the rain the track was still wet, but the cold front which pushed out the rain brought a dry wind which helped dry the track, so teams had to gamble on whether to run wet-weather set-ups—typically softer to maximize grip—or dry-weather, or a compromise, and then had to decide how much to change after every round of qualifying. Everyone chose rain tires for the first session (Q1) and slicks the next two rounds, but this still left crews with tough choices. The engineers had to try to guess how much dryer the track would be after each session, then adjust the car for how they thought conditions might be. Further, Firestone was providing a new Option tire, and teams didn’t know how it would behave under stress. Firestone provides each team with a certain number of sets of Prime and Option tires, called Blacks and Reds after the color of their sidewalls. The Primes generally last longer but don’t grip so well; the Options are sticky but might only last a dozen laps or less. Teams had to gamble on when to put reds on the car; wait too long, and another team might knock them out of qualifying by going faster on their Reds. Switch too soon, and the teams risk burning up two sets of red ties and having only one set for the race, when the extra speed might provide a winning margin. Marco Andretti, in the #25 Snapple Andretti Autosport car, chose to save a set of Reds. He made it into the Fast Six and then re-used the Reds from Q2 in Q3, sacrificing performance—and grid position—in order to save a set of Reds for the race. During the race Andretti can start the race on Reds, and get ahead of teams starting on Blacks, and also finish the race on Reds, meaning he will be quicker than teams which started on Reds and switched to Blacks, and on par with but possibly ahead of teams which started on Blacks. All this depends on if there are caution periods, and if so when they fall and how long they last. Andretti will start sixht. Had he used another set of Reds, he might have been a few places further forward at the start, but the race is 110 laps long. No one will know until the checkered flag waves whether his gamble will pay off. Sato’s success is his team’s success, literally. Sato did an excellent job of driving; that goes without saying. He would not have gone fastest by driving badly. His edge came from his team. As Sato explained in the post-qualifying press conference, the team had tested extensively over the winter, had pored over data from the 2013 season, and had figured out how to make the car faster. Not only that his entire team, from the chief mechanic to the guy who checks tire pressures, was intact from 2013, so everyone worked well as a unit. When Sato’s engineers and mechanics had to decide what to adjust after each session to adapt to the changing conditions, they had data to inform those decisions, and they made the right changes quickly. Thus Sato knew he had the best car his team could give him each time he took the green flag—and in return he gave his team pole position. It didn’t hurt that other teams had their issues. 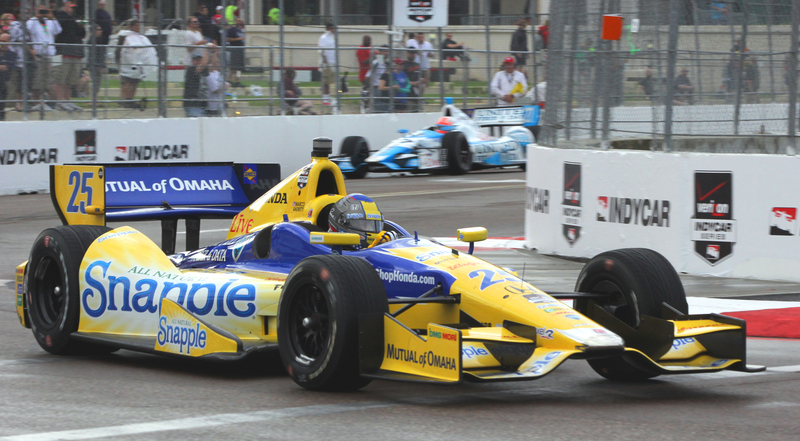 Marco Andretti decided from the start not to contest the final session. His teammate Ryan Hunter-Ray lost a few minutes to an electrical problem. 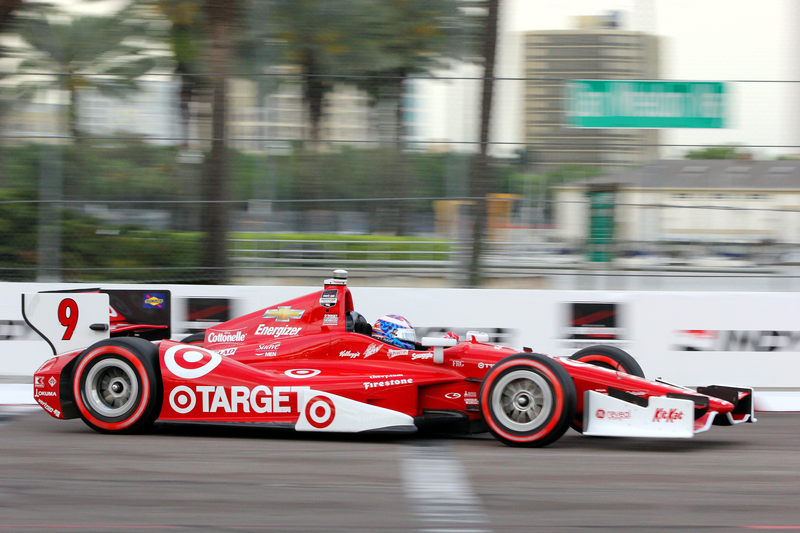 Scott Dixon started his fast lap just as teammate Tony Kanaan slid off the course in Turn One; he was able to continue but dixon never got another shot at a totally clean lap on fresh tires. As for Kanaan, he mentioned that the track seemed slipperier this year than in any year prior, so possibly he was lacking grip. In any case, he qualified second, a very respectable showing for a driver new to the team. 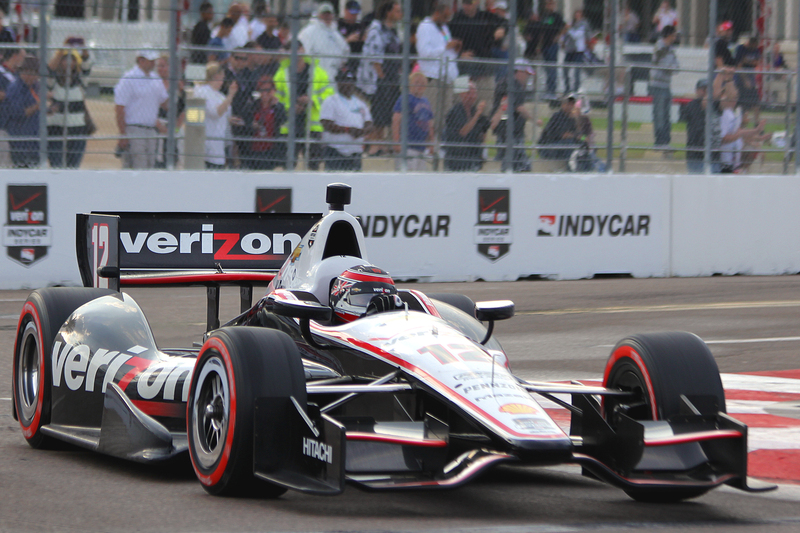 Will Power, so often on the pole at St. Pete, simply didn’t have the car to do it this year. “The Fast Six, that was as quick as I could go,” he said afterwards. 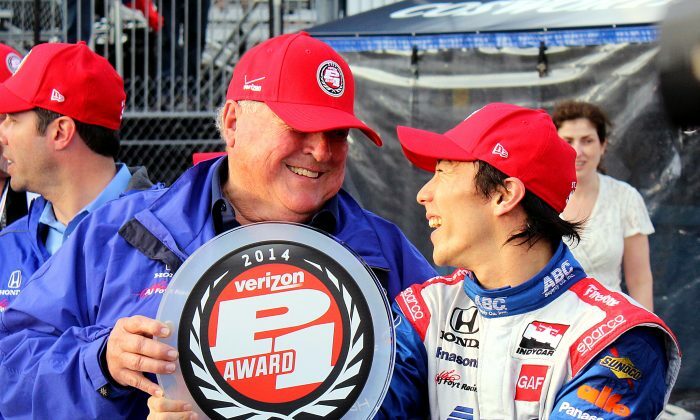 Takuma Sato had it all in St. Pete Saturday evening. He had a good car, he was on good form, he had good luck. He and his team maximized every advantage, and it paid off. The 2014 IndyCar Firestone Grand Prix of St. Petersburg will take the green flag shortly after 3 .p.m. Sunday, March 30. Tickets are still available through the Grand Prix of St. Petersburg website. For those who cannot make it in person, the race will be televised on ABC starting at 3 p.m. Sunday, March 30.